A cold front is slowly approaching from the west this evening and will arrive in far NW areas tomorrow morning before slowly sinking SE through the day tomorrow. This will bring showers and storms to the area, some of which could be severe. The risk for severe storms is greatest across far southern areas where the most instability will reside. Cooler and drier air filters in Sunday though a pop up shower is possible in the mountains. Cooler and drier air sticks around for Monday before heat and humidity slowly build back up again for mid-late next week. For more details as to the why behind the what, read on for a full analysis of the upcoming week of weather. Conditions this evening verify this morning’s forecast well with mainly sunny skies and warm temps observed across the area. As forecast, some more clouds are located over NW areas closer to the front. Temps are generally in the mid to upper 80’s with a few overachieving spots hitting 90. Temps up north and along the coast are cooler. Overall, this morning’s forecast worked out pretty well. The only exception might be that forecasted showers didn’t materialize in the mountains. The front will continue to approach this evening and a batch of showers and storms currently just west of the St Lawrence valley will be drifting into the area by early tomorrow morning. Expect this batch of showers to be weakening as it approaches and it may just be some clouds by the time it reaches the coast. The moral of the story is that by tomorrow morning, the umbrella will need to be on standby as showers mainly of the light variety drift across the area. Temps tonight will remain in the 60’s for most with low 70’s south and west. The more noticeable factor will be the humidity which will be not too far below the temps. 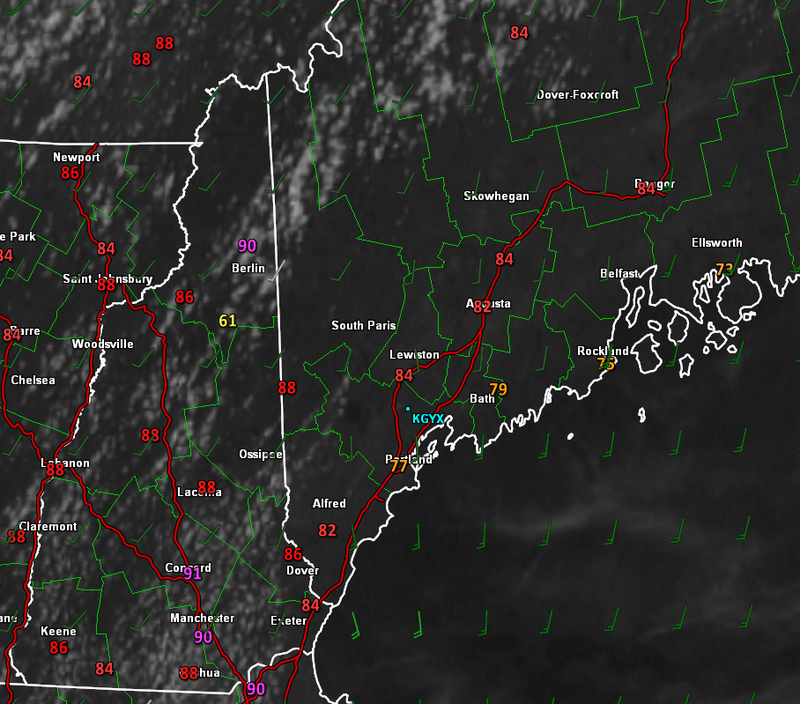 Soupy readings near 70 are likely by tomorrow morning. That moisture will help fuel storms tomorrow afternoon. As I’ve discussed many times over the course of the summer, there are three things you need for widespread severe storms: a trigger, some fuel, and something to fan the flames. The trigger will be the cold front at the surface and an upper level disturbance aloft. The main storm both at the surface and aloft will remain well north of the area in Northern Canada but a filament of it will be swinging through our area tomorrow afternoon. There is little doubt that we will have enough of a trigger for storms tomorrow. 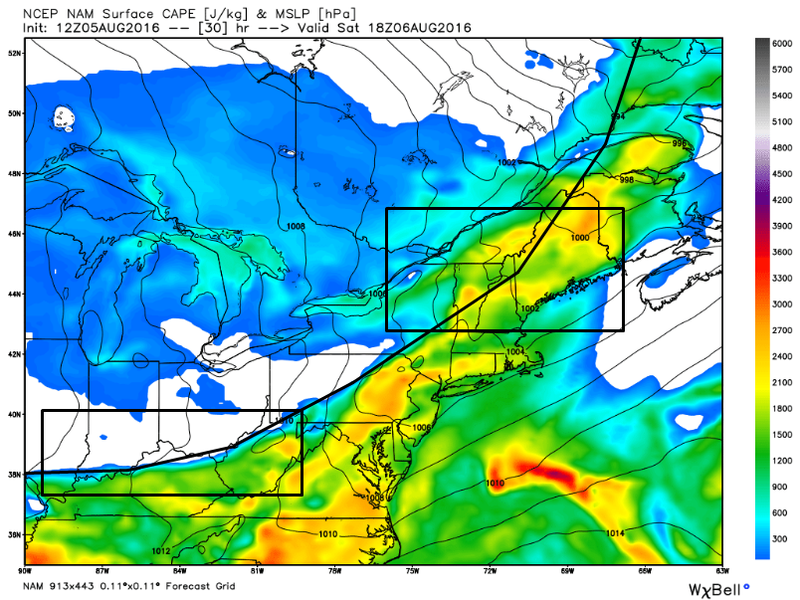 There is plenty of shear around tomorrow to organize storms into segments capable of strong winds. 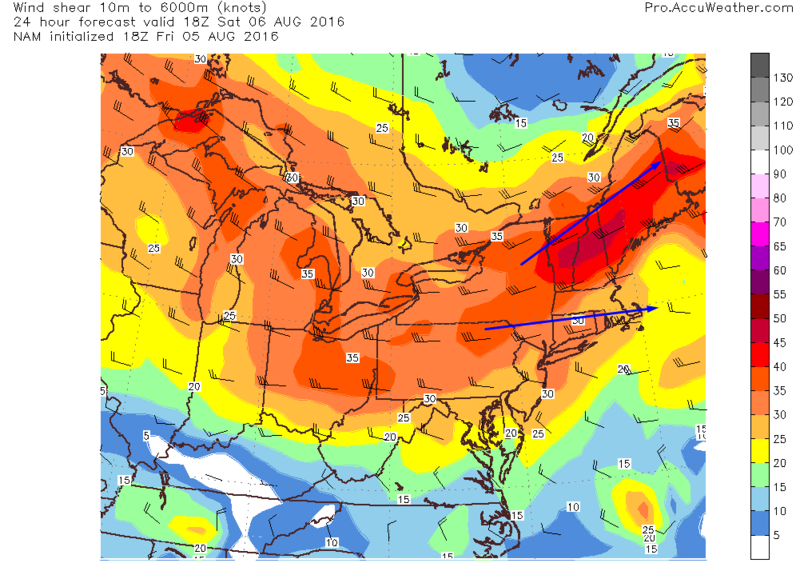 Not only that, winds aloft will be pulling apart (black arrows) which will leave a ‘gap’ in the atmosphere aloft. To fill the gap, air from below will be rising. Rising air aids in storm development and the divergent flow aloft will be aiding in synoptic scale rising air. 30-40kts of 0-6km shear will be the organizer. There is high confidence that we will have a trigger and an organizer for tomorrow. The big question will be how much fuel do we have. There are two possibilities for how much fuel is available tomorrow. Either there’s a bunch or there’s not a bunch. If the front is slower and there is more time for the sun to heat the ground ahead of it, we’ll have more fuel for bigger storms. The opposite is also true if the front is faster. 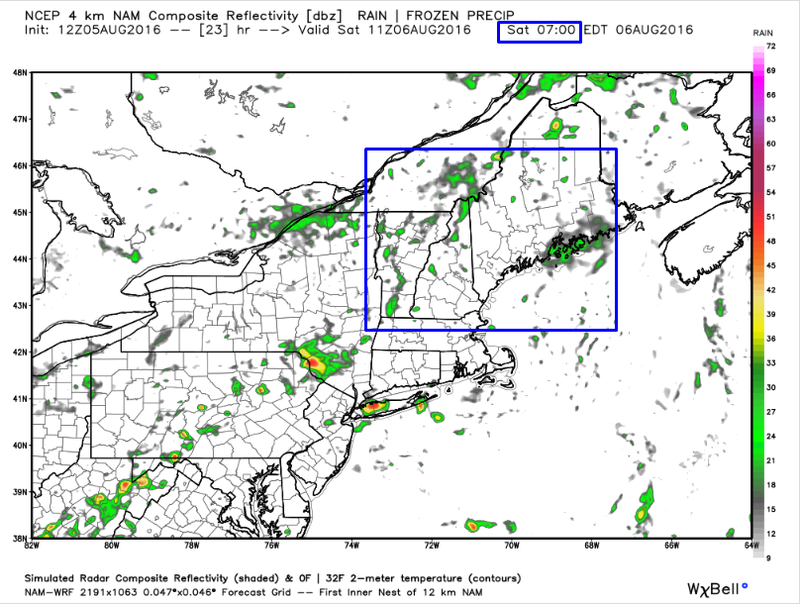 Notice how over Northern New England (NE black box) there is instability on both sides of the front? 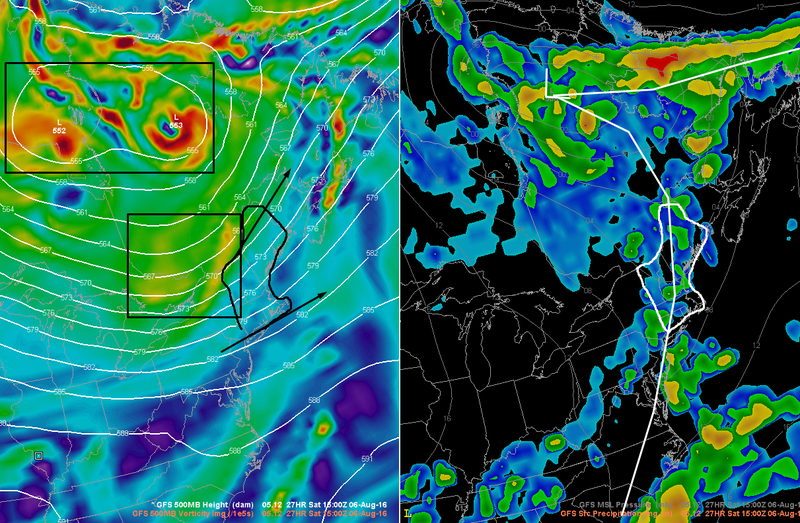 Notice how this contrasts with the conditions over the OH valley (SW black box). The atmosphere is set up so that not all the moisture is chased off the instant the front arrives. As a result, even with a slightly faster front, there could be some storms. Now how fast do I think the front will move? For that, let’s examine the pattern as a whole. The current pattern is quite amplified for the summer months. A large ridge extends from New England to Baffin Bay (red line) with an Omega block over Baffin Island (red box). Low pressure flanks this high both over the North Atlantic just south of Greenland and over Hudson Bay (blue boxes). The Hudson Bay low is the one we really care about because our disturbance is moving along the southern flank of it (pink line and arrow). 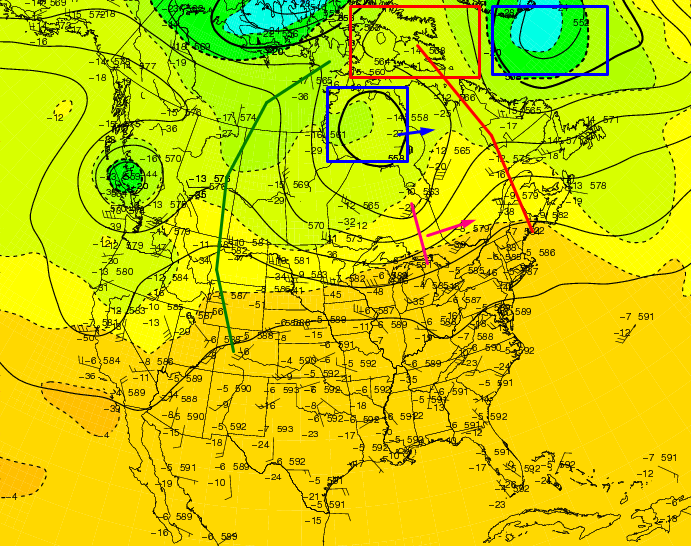 Because of the wall of high pressure to its east (red line/box), both the low and the disturbance have nowhere to go. The high isn’t moving particularly fast because the whole pattern is blocked up (low S of Greenland, high to its east, low to the east of that, high to the east of that, and so on). Because of the blocked pattern, I tend to think that everything will be moving a little slower which would lead me to lean a little bit towards the NAM solution of higher energy. Of course, even with a slower front, strong storms are far from a guarantee. Remember that there will be showers ongoing across the area tomorrow morning. Showers come with clouds and clouds don’t let as much sun through which means that the ground can’t heat up as fast or as much. A cooler surface temperature means that the difference between the surface and the upper atmosphere is slightly less which results in less energy for storms. For more on how this works, check out my UpPortland column from July (now online as a direct link!). The greatest chance for strong to severe storms will be across southern areas where strong instability is most likely. The greatest threat will be for strong winds with lightning and heavy rain always possible with any storm, even those that are non severe. When thunder roars, go indoors! 12Z GFS Showing The Outlook For The Next Week. What happens after the front drifts offshore Saturday night? Cooler and drier weather is in the forecast for Sunday and into early next week (orange box, look at those dew points (green line)!). A spot shower is possible Sunday but otherwise the rest of the outlook looks fairly dry as we continue to grow our rain deficit. More heat and humidity threatens by mid to late next week. Looking even farther into the future, a typhoon will be recurving off the coast of Japan this week which will set off a chain event across the entire Northern Hemisphere by the end of next week. Tropical moisture will be pooling off the Florida coast over the Gulf of Mexico during the same time. The pattern will be changing as a result of the typhoon so that a high pressure system will organize near Bermuda. The flow on the west side of the Bermuda high will be pointing that tropical moisture in our general direction by next weekend. At this point, that looks like our next chance for a steady, heavy rainfall. I’ll continue to watch it as we get closer. I have to say that your reports are as professional as any. Very well written as well as informative.